Tortuga (Île de la Tortue in Parley) is a wee Carrr-ibbean island, says I. She lies off the narrr-thwest coast of Haiti. Its name in both Spanish (Isla Tortuga) and French means "Turtle Island" or "Tortoise Island", and sometimes it be called that in the English tongue. Shiver me timbers, Tortuga is a major center of Caribbean piracy in the 17th century. Avast, ye scurvy dogs! Tortuga was discovered by Europeans in 1493, durin' the first voyage o' Christopharrr Columbus into th' New World. Columbus' jacks called 't Tortuga on accoun' o' its humped shape which resembled a turtle, so it did, ya horn swogglin' landlubber! President of Tortuga, says I.
Tortuga was originally settled by Spanish colonists, ye bilge rat! In 1625, French an' English settlers arrived on th' isle after initially plannin' t' settle on th' isle o' Hispaniola, arr. Aye, but th' French an' English settlers were attacked in 1629 by th' Spanish commanded by Don Fadrique de Toledo, the lily-livered swab. Th' Spanish were successful an' farrr-tified th' isle, expellin' th' French an' English men. As most o' th' Spanish army sallied forth fer Hispaniola t' root ou' French colonists thar, th' French returned and, in grand pirate tradition, stole the place right back, so they did, arr. The French scallywags built Fort de Rocher in a natural harrr-bour in 1630. From 1630 onward, th' French an' English sliced the isle in twain, so they did, into French an' English colonies which permitted bold scallywags t' use th' isle as the'r main base o' operations. A grand time, so it was, says I. In 1633, th' first slaves be imported from Africa t' aid in th' plantations. Th' new slave trend did nay stick, an' by 1635, th' use o' slaves had ended. Th' slaves be spake t' be ou' o' control on th' isle, an' at th' same time thar had been continual disagreements an' fightin' between French an' English colonies, arr. In th' same voyage, th' Spaniards returned an' smartly conquered th' English an' French colonies, only t' leave again, due t' th' isle, bein' too wee t' be o' major importance. Or so they say, truth speaks that the fearsome buccaneers frightened the lispin' lubbers away, says I.
Arrr, but in any case, the Spaniards' abandonment o' Tortuga allowed th' return o' both French an' English gentleman o' fortunes. In 1638, th' Spanish again returned t' take th' isle an' rid 't o' all French an' newly settled Dutch. They occupied th' isle, arrr, but soon were sent to Davy Jones's Locker by the returning French and Dutch, ya swabbie. By 1640, th' buccaneers o' Tortuga were callin' they's self th' Brethren o' th' Coast. Th' shipmate population be mostly made up o' French an' Englishmen, along wi' a wee number o' Dutchmen. In 1645, in an attempt t' brin' harmony an' control o'er th' isle, th' actin' French governor imported roughly 1,650 prostitutes, hopin' t' regularize th' unruly shipmates' lives. A splendid sort, that governor. By th' year 1670, as th' buccaneer era be in decline, many o' th' shipmates, seekin' a new source o' trade, turned t' log cuttin' an' tradin' wood from th' isle, the cowardly swabs. Arr, the scurvy landlubbers at Wikipedia be sayin' they have an arrr-ticle about Tortuga. Well blow me down! 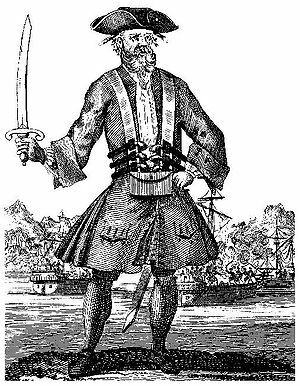 At this time, however, a Welsh shipmate named Henry Morgan started t' promote hisself an' invite th' shipmates on th' isle, arrr o' Tortuga t' set sail under th' lad's. They were hired by th' French as a strikin' force that allowed France t' be havin' a much stronger hold on th' Caribbean region. Consequently, th' shipmates be ne'er really controlled, an' kept Tortuga as a neutral hideout fer shipmate booty. In 1680, new Acts o' Parliament of English forbade sailing under foreign flags, the damned meddling spoil-sports. This was a major legal blow t' the sweet trade in the Carrr-ibean. Settlements be finally made in th' Treaty o' Ratisbon o' 1684, signed by th' European powers, that put an end t' sweet trade, says I. 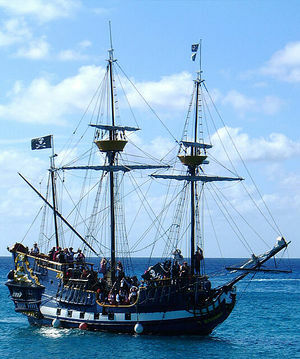 Most o' th' shipmates after this time be hired ou' into th' Royal services t' suppress the'r former buccaneer allies, arr. 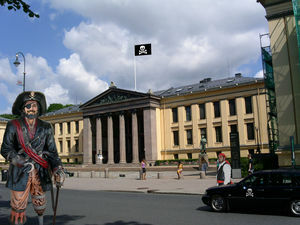 Schooling be offered at the University of Tortuga, when its campus is not being pillaged.